Kevin Dundon introduces a modern twist to a classic parsnip tray bake. 2. Put the parsnips, onion, garlic, pancetta and herbs on a large baking tray. Drizzle with olive oil and toss to coat the vegetables. 3. Roast in the oven for 25 to 30 minutes, then add the pears and drizzle over the honey. Continue roasting for another 10 minutes, until all the veg and the pears are nicely coloured. 4. 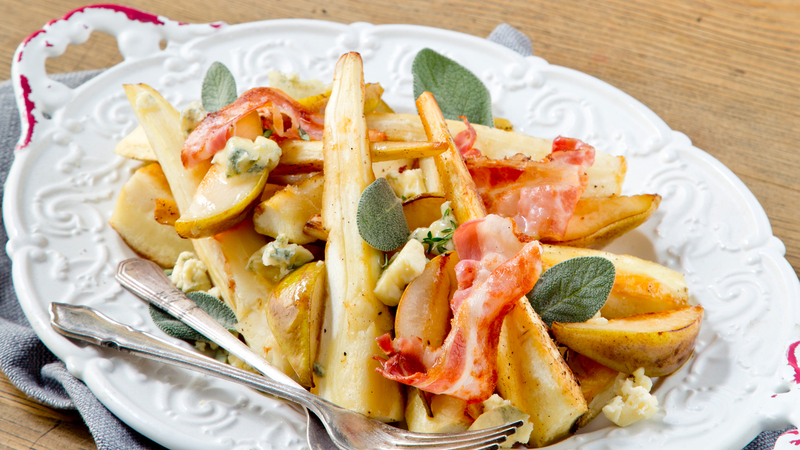 Transfer to a serving platter, then crumble over the blue cheese to soften slightly from the heat of the parsnips and pears. Garnish with a few whole sage leaves and serve immediately.